I just got back from 8 days at the parks. And a great 8 days it was. 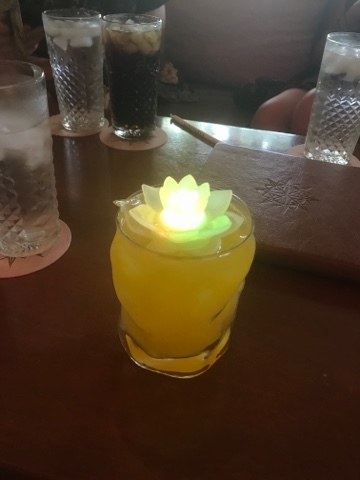 Part of the reason for that is the Nomad Lounge, my favorite bar/lounge in the parks. For starters, there is the atmosphere. A way station for nomads traveling the world. 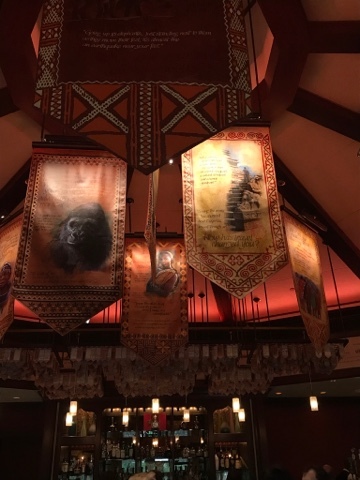 With its dark interior, gorgeous deck along the discovery river and beautifully made banners hanging from the ceiling, the place oozes relaxation: a rarity for sure in a theme park, especially with the mad crazy Avatarland just across the bridge. But we have discussed this bar many times and how much we love it. I wanted to touch a little bit on the menu. Both drinks and food. The cocktail list is different from anywhere else in the "World." That by itself would make this a must stop since many other lounges have the standard Disney bar menu. Some of my absolute favorites are the Annapurna Zing (gin, passion fruit puree, mint and ginger beer) and the Hightower Rocks (tequila, watermelon, sweet-n-sour and lime juice). Hightower is an homage to Joe Rohde as that is the name of his fictional S.E.A. character at the Tokyo DisneySea version of the Tower of the Terror. And then there is the Mustang Coffee. 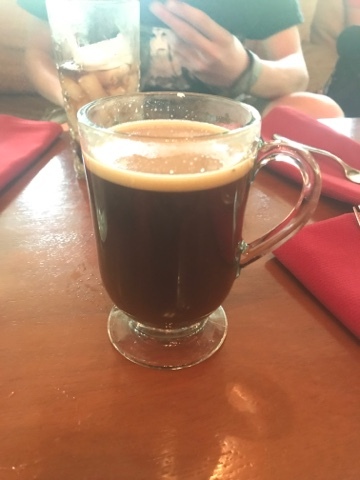 Its a delightful mixture of coffee, Crown Royal, brown sugar and melted butter. It may sound a bit strange but if you like coffee this is amazing. Now for the food. 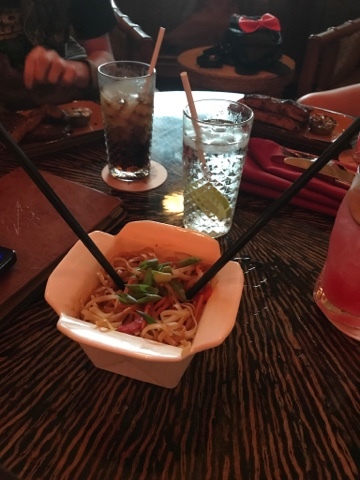 Chefs at the Nomad Lounge and the adjoining Tiffins have recently begun experimenting with new items. The original menu will see lots of changes in the upcoming weeks and months. One addition that I tried on its first day was the posole soup. 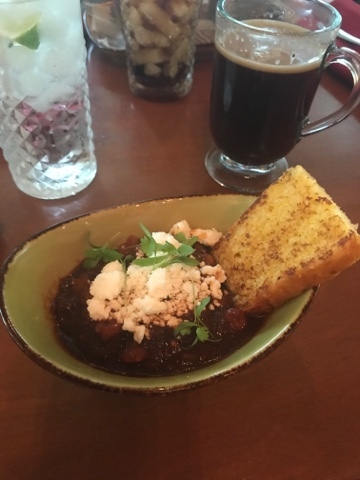 Made from wagyu beef, hominy and chili, it was delicious and the accompanying jalapeno cornbread was a nice side. 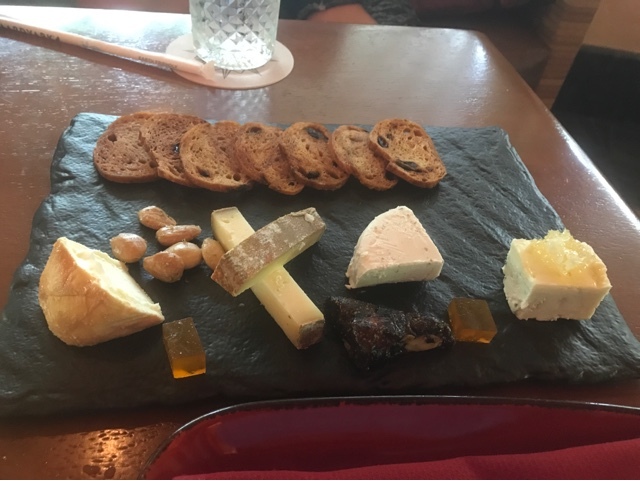 On another day, I had the cheese plate which is always a great choice. I also was able to try another brand new item, the vegetable pad thai, which replaced the spring rolls. I loved the spring rolls, but this was just as good. And finally, there are the churros. Easily, the best churros on property. Hands down, no question about it. They are fresh, warm and soft unlike the ones you get at carts throughout the park. Hand made right there they are accompanied by 2 dipping sauces, vanilla cream and strawberry-chili. A waitress there told us they are best when mixed. She wasn't wrong. 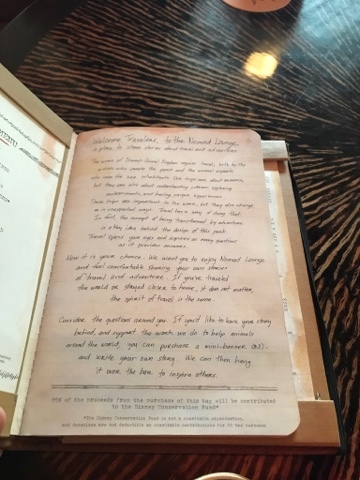 I'm sure everyone who reads this blog or listens to Radio Harambe is well aware of the Nomad Lounge. But next time you are there, try some of the food, you will not be disappointed. 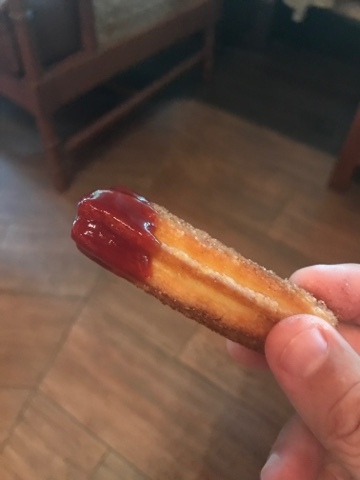 At least get the churros.